We offer a range of cash registers for sale. 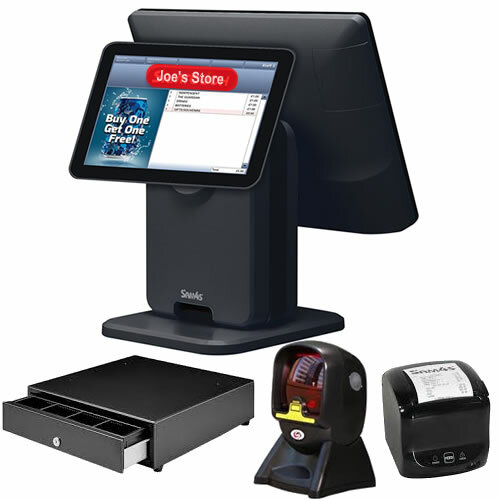 These tills are suitable for all types of retail shops, supermarkets, newsagents, cafes, take-aways, bars and restaurants. We deliver all over London and the rest of the UK. FAST DELIVERY: Call us on 020 8936 7000 for technical advice or to order by phone. Or Order Securely Online 24/7. Save time and hassle with our Optional Programming Service - your till is delivered profesionally preset with your business details, keys neatly labelled and the requested features activated, so its ready to unbox, plug in and use immediately. (Please allow 2-3 working days for programming work to be scheduled and the programmed till to be despatched). Basic Tills are compact-size, low-cost, simple cash registers. They are best for new startup businesses or small shops and kiosks where all you require is a very basic till with an end of day sales / financial z report for the daily sales takings. Cheap to buy and easy to use, these are perfectly suited as budget tills. Retail Tills are for busy shop use with a full-size cash drawer. They print your store's name and address on the customer till receipt. A rear customer display is included on most models. Retail cash registers include more department keys for sales analysis and other functions. The tills provide daily and periodic sales analysis reports. Hospitality Tills are ideal for take aways, pubs, bars, cafes and restaurants. They have spill-proof keypads and preset keys which allow your most popular menu items to be programmed for fast One-Touch selling. You can run meaningful sales analysis reports showing how many of each Product has been sold and the value. We have tills with 60, 72 and 100+ preset keys, as well as tills with integrated touch screen for easier and faster sales processing. Scanning Tills allow you to improve efficiency and process sales transaction quicly and accurately, increasing customer satisfaction. By storing the description, price, department and vat rate for all your products they are referenced speedily just by scanning the barcode. We have barcode scanning cash registers with capacities of 3000, 6000, 10,000 and 60,000+ barcodes. Optional stock control and more sophisticated touch screen POS systems are also available. Dry Cleaning Tills provide all of the standard retail till features but also allow you to print Customer Tickets and Garment Stubs onto an external printer (included with the till package), maintain ticket numbers, keep a customer database and keep track of items for dry cleaning. laundry & repair/tailoring. We can supply the till for you to easily setup yourself, or we can optionally provide a full setup, on-site installation and training service throughout London and the rest of the UK to help you to get the most of the cash register and be up and running immediately - see our Cash Register Services section. Discounted cash register and touch screen installation services are available in the areas of London including Hendon, Edgware, Burnt Oak, Colindale, Kingsbury, Harrow, Mill Hill, Barnet, Golders Green, Finchley (East, Central, North), Cricklewood, Brondesbury, Willesden Green, Neasden, Harlesden, Hampstead, Highgate,West Hampstead, Queens Park, Belsize Park, Brent Cross, Chalk Farm, Camden, Kentish Town, Kings Cross, Islington, Wembley, Brent, Alperton, Kilburn, Paddington, Bayswater, Edgware Road, Marble Arch, Maida Vale, Bayswater, Wealdstone, Park Royal, Pinner, Kensal Rise, Kensal Green, Marylebone, Baker Street, Regents Park, St Johns Wood, Swiss Cottage, Queensbury and Stanmore.